There is consent among researchers that climate change results in increasing number of extreme weather events, migration and even the need to resettle entire populations. Understanding the behaviour of climate refugees and people exposed to extreme events are key in order to avoid emergency mass movements or even conflict over natural and social resources. I propose a research project with two related parts that identify the human reaction to the impacts of climate change by combining a comparative research design and the use of economic experiments, survey methods and modelling techniques. The first part of the project builds upon a unique sample of experimentally measured risk and solidarity preferences of 800 Filipinos taken in 2012 in. In order to assess the impact of the damages induced by typhoon 'Haiyan' and the following recovery aid we will carry out two follow-up studies with the same people in order to obtain panel data on solidarity and risk preferences for robust statistical inference.The second part of the project will focus on the effects of anticipated forced and permanent relocation. The major innovation offered by the proposed set-up is a sample of inhabitants from atoll and island communities where the communities only differ in the timing of the expected relocation due to sea level rise with additional use of priming techniques. The set-up allows studying how preferences and behavior of people change with the prospect of being severely affected by climate change and whether and how these affect short and medium-term adaptation strategies such as an increased extraction of natural resources and migration. Climate change, migration of human populations, and environmental degradation are interrelated in a complex coupled human and natural system. While people have historically abandoned places with harsh conditions, the scale of these flows is expected to increase dramatically as a result of climate change. Environmental migrants are individuals forced to migrate from their home region due to sudden or long-term changes to their local environment compromising their well-being or secure livelihood. Such changes include severe droughts, desertification, sea level rise, and disruption or intensification of seasonal weather patterns. There is consent among researchers that climate change will result in increasing migration and even the need to resettle entire populations. Myers (1997) estimated that there will be 200 million environmental migrants in 2050 and later confirmed these figures, adding that "environmental refugees will soon become the largest group of involuntary refugees" ( Myers 2002 ). These projections are in line with those reported by the Intergovernmental Panel on Climate Change (IPCC) and the Stern Review on the Economics of Climate Change. While there exists a huge literature on the bio-physical impacts of climate change for various regions and sectors, less is known about the impact of climate-induced migration on natural systems. Migration can have positive and negative effects on the environment in areas from which these migrants originate, as well as in their temporary or permanent destinations. In order to understand these impacts it is crucial to study how climate events change the pro-sociality of people, their social networks, and society as a whole. Such research is not only of scientific but also of practical importance. Pro-social behaviour spurs cooperation among resource users and stakeholders and is central to natural resource management, community-based activities, and co-management. Understanding how environmental context – such as differences in exposure to risk– influence cooperation and environmental behaviour more broadly will help develop more robust theories of how human and natural systems interact. From a practical point of view, better models will allow us to predict how people are likely to change their behaviour in light of future climate changes, and build scenarios about potential responses to extreme events. These predictive models would enable us to study in a virtual environment various policy interventions that are hypothesized to be effective instruments for reducing ecological systems stress and protecting human well-being. In light of these considerations, I therefore believe that my interdisciplinary and policy-oriented research project fully supports the aims of the Robert Bosch Junior Professorship. Fig. 1 provides a synopsis of my main research questions, and how they inform a better understanding of the complex ways in which populations are likely to adapt to climate changes. Ultimately, this research seeks to predict how people respond to shocks through migration and changing patterns of resource use. My research design allows for both a forward- and backward-looking perspective on these issues, by examining how at-risk populations might adapt to environmental change, and by examining how populations who have already experienced climate-related shocks responded to these shocks. This research culminates in the development of empirically-grounded and spatially-explicit agent based models of how populations – and the stress that populations place on natural resources – will shift as a result of climate change. An overview of research questions. To realize these goals, this research will address two specific research questions. First, we need to understand how people learn about their exposure to risks. On the one hand this is a matter of learning about risk (i.e., reducing the gap between perceived risks and actual risks) through a combination of personal experience and information exchange with informal social contacts or with formal organisations such as NGOs. We hypothesize that being exposed to risks leads to an updating of beliefs about costs and benefits of certain actions, a change in behaviour and ultimately to a change in experimentally-measured preferences (i.e. how people value certain goods relative to other goods). 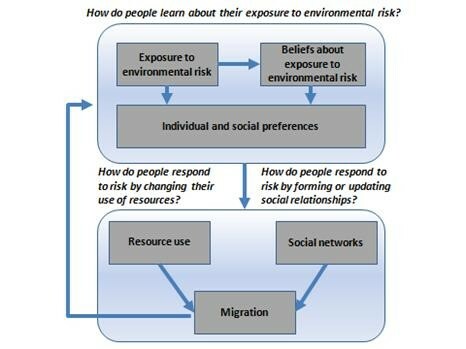 Second, understanding how people learn about risks will help us to understand people's choices related to resource use, network formation and migration. Resource use patterns and support from the social networks are important in itself but they also influence the likelihood of migration. A collapsing resource base will encourage people to migrate while migration also reduces the stress on the resource. Likewise, a strong social network may give people the means to migrate, while on the other hand it may also strengthen emotional ties to current locations which might prevent migration. The resulting resource use, network and migration pattern again changes perceived and actual exposure to risk. The research project will identify the human reaction to severe impacts of climate change by combining an original comparative research design and the use of economic experiments, survey methods and modelling techniques. Four PhD students will examine the behavioural motives of potential climate refugees (shadow of the future) and people who were exposed to extreme events (shadow of the past). Cooperation for natural resources strongly depends on the possibility for future interactions with other community members (i.e. having a shadow of the future) as well as on the history of past interactions and reputation of other community members (i.e. shadow of the past). Understanding the underlying responses of people to past and future climate events is thus, crucial to foster cooperation and to avoid conflict over natural and social resources or even emergency mass movements and violent conflict. Effective policy interventions will increase the quality and quantity of alternatives available to people facing environmental degradation. Understanding the motivations and behaviours of potential climate refugees will also allow quantifying the expected number of migrants more accurately, which is helpful in practice for adapting policy and legal regulations. agent-based modelling for predictive scenario analyses. Our comparative design will sample people who have been exposed to natural disasters (shadow of the past) and people affected by different degree of sea level rise (shadow of the future). Our research sites are the Philippines, which were affected by Typhoon Yolanda (also known as "Haiyan") in 2013, (shadow of the past) and the Solomon Islands (shadow of the future). In the latter case, we sample people from low lying atolls and from islands as well as people who already migrated from the atolls. How does the variation in context affect behaviour? We propose that such severe changes in perceived environmental risk also affect people's preferences. In the same vein, the forthcoming World Development Report 2015 draws on a large number of studies in Behavioural Economics and asserts that context has large effects on human judgment and behaviour; and social norms motivate much of what people do. Preference parameter estimates are used by economists as inputs for measuring welfare and conducting policy analysis. A huge body of literature has documented the predictive power of individual and social preferences for individual behaviour. However, until recently, most economists have assumed preferences (including pro-social preferences) to be exogenous. Economists take individuals “as they are” without asking how they come to want and value things ( Bowles 1998 ). This simplifies the analysis of planned policies or changes in the environment as predictions about future behaviour can be more easily made *1 . Indeed, according to experimental studies, pro-social preferences develop with age from children to adolescents but seem to remain stable over time for adults ( Carlsson et al. 2014 ). Yet, an emerging approach, which we also propose here, examines the relationship between lifetime events or broader contextual factors and the evolution of preferences using economic lab-in-the-field experiments in different settings to explore various relationships. Experimental studies in this vein have investigated how behavior is affected, inter alia, by market integration ( Henrich et al. 2005 ), religion ( Henrich et al. 2010 ), exposure to different political systems ( Ockenfels and Weimann 1999 ), production technologies ( Leibbrandt et al. 2013 ), conflict ( Bauer et al. 2014, Voors et al. 2012 ), natural disasters ( Eckel et al. 2009 or working paper by Cameron and Shah or Cassar) and long-term resource scarcity ( Prediger et al. 2014 ). These studies report remarkable evidence in favour of both long-term and short-term endogenous preference formation. Endogenous preferences are preferences that cannot be taken as given, but are affected by external factors. They are interdependent, in part determined by social institutions and subject to learning and habit formation through past-experiences. Yet, if preferences change in certain situations, then policy analysis and scenarios relying on fixed preferences might be misleading as preferences might change simultaneously. This study contributes to a growing literature that analyses how real world context affects human behaviour. We selected independent but interlinked topics/research sites to examine the impact of climate change on adaptation strategies and we propose to integrate these results in a modelling framework that allows predicting future resource use and migration patterns. The Philippines is among the countries most vulnerable to climate change, as it is most frequently hit by typhoons or earthquakes causing an estimated $1.6 billion in losses each year. Catastrophic events can dramatically alter existing social and economic relationships. Understanding and improving the way people deal with such shocks is highly important to prevent future poverty. Risk-sharing could be one way to better cope with such shocks. A large fraction of income is transferred between families to make up for losses. In a recent experimental study in the Philippines, we confirmed these high levels of informal money transfers among group members to compensate losses. An emerging body of literature has examined the impact of natural disasters on preferences and behaviour. Yet, these studies produce very different results regarding whether people become more or less cooperative, possibly because of difficulties in establishing causalities, in defining the interaction partner (e.g. within vs outside the village) and using the right measurement instrument *2 . One potential methodological problem with these studies is the lack of a baseline experiment to control for initial heterogeneities among different villages. Our study aims to fill this gap and provide solid evidence on the formation of preferences due to past catastrophic events. To identify causal relationships and use appropriate econometric methods of analysing panel data sets, I plan to cooperate with Professor Bernd Hayo and his empirical research team at the host University in Marburg. In subproject 1, we will implement two follow-up studies in the second and fourth year after the typhoon in order to assess the impact of the damages induced by typhoon Yolanda. More specifically, we explore the causal effects of being hit by Yolanda building on a unique panel data set for a range of outcome variables (especially experimentally measured risk taking and solidarity transfers from the unaffected to the affected people, as well as survey items on social networks and trust). Our main hypothesis is that catastrophic events not only alter social and economic relationships but also the fundamental ways in which people behave. Ever since Charles Darwin it has been long argued that adaptation to the environment might favour the persistence of certain traits or behaviours that help the survival of the group. We will link the two follow-up studies to our baseline (800 Filipinos in 2012 in Region VI) as well as to official data on reported destruction per village in order to create a unique panel data set based on experimental games. Furthermore, we will analyse the impact of recovery aid and how this affects social network formation and preferences. We will also test whether existing social capital (reflected in voluntary organization membership, collective action, trust and social relationships) prior to the catastrophic event helped people, as individuals as well as communities, deal with the disaster. In addition to past events, anticipated future events will also influence individual behaviour. Many environmental scientists believe that the sea level will rise as a consequence of global warming and the Solomon Islands will be heavily affected by such an occurrence. In 2005, it was officially decided to evacuate the 1,000 residents of the Carteret Islands, a group of small and low-lying coral atolls belonging to Papua New Guinea neighbouring the Solomon Islands. Given that the threats are perceived as real by scientists, the degree of perceived risk still differs among people, since they learn in different ways about these risks from personal experience and information exchange with informal social contacts or with formal organisations, such as NGOs. The major innovation offered by the proposed set-up is to sample inhabitants from atolls and island communities in the Solomon Islands, where the communities only differ in their expected exogenously determined impacts of sea level rise and other stochastic environmental changes and not with regard to social, economic, cultural and historical aspects *3 . With a combination of survey and experiments and modelling we aim at analysing how risk perception, preferences and behaviour of people change with the prospect of being severely affected by climate change and whether and how these preferences translate into choices for short- and medium-term adaptation strategies *4 . This could be towards more individualistic (i.e. migration and/or resource overexploitation) or collective strategies (i.e. solidarity transfers and sustainable use of resources). In most cases it is extremely difficult to isolate one single environmental factor as an independent variable from which to deduce its impact on a human activity, such as migration. This is mostly due to the fact that environmental factors are intertwined with other social and economic factors also encouraging migration. Furthermore, it should be taken into account that in some cases the loss of the resource base is, at least partly, self-inflicted and not the result of a global phenomenon beyond the influence of local populations (i.e. desertification, deforestation, soil erosion exacerbated by changing climate conditions). In order to overcome this drawback, the proposed study will focus on one specific population that is most likely affected by one single environmental event exogenous to the behaviour of the population itself (in contrast to self-inflicted) and where adaptation is expected to fail. We plan to select communities along a continuum of expected sea level rise as well as already migrated households. According to scientific evidence, atolls will soon and certainly inundate, while high lying islands do not face these threats. The prospect of inundation is likely to shorten individuals’ possibilities for future interactions which negatively affects cooperation and thus increases the likelihood of migrating and the use of adaptation strategies that negatively affect the environment, such as coral reef and mangrove destruction, marine pollution, land degradation, deforestation, freshwater degradation and the depletion of fisheries. Laboratory experimental evidence shows that the existence of a shadow of the future in an infinitely repeated social dilemma experiment prevents people from behaving selfishly, which is the outcome of a finitely repeated version ( Dal Bo 2005 ). Thus, knowing that the resources cannot be used by future generations might lead to a moral disengagement and a focus on short-term benefits leading to the overuse of natural resources. While the hypothesis that perception of risk encourages less sustainable behaviour (because you need to use it or lose it) seems clear, it is less obvious whether the same expectation also holds for climate refugees in the region to where they migrated. If the behaviour of climate refugees is only destructive in their region of origin, then some sort of “controlled” migration could be a preferable option. In subproject 2, we thus employ a battery of individual and social preference experiments combined with priming videos about future sea level rise scenarios and link them to secondary data and survey data in order to establish a causal link between perceived risks and changes in preferences. Since the exact remaining time horizon until inundation is unknown, it is still important to sustainably use the available resources and actively engage in various forms of collective action in order to further prevent desalination and erosion, which would aggravate the problem leading to much earlier inundation. Bounded rationality, preference heterogeneity among group members, and time constraints are obstacles to efficient information generation and information revelation. In subproject 3, we will design survey experiments related to the confirmation bias. Do people consider information that does not coincide with their initial belief? And how does the information bias affect the willingness to migrate or other adaptation actions. The research outcomes of this proposal will address a set of interlinked research questions of high theoretical importance, but that also shed light on important policy issues for the sustainable use of natural resources in many developing countries. 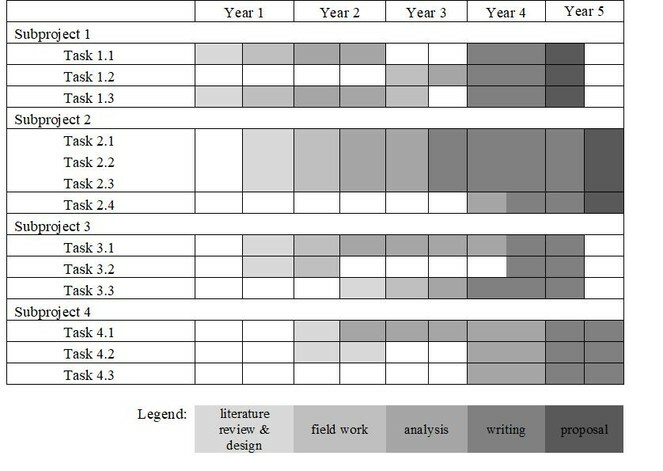 Given the unique setting of the proposed study and the range of methods used, it seems advisable to integrate our findings within a unifying modelling framework. In subproject 4, we will develop a series of agent-based models representing the behaviour of individuals and study how variation in risk is likely to influence resource extraction, cooperation in social networks, and migration. The model will allow for an examination of possible changes in resource use over time as a result of simulated climate change, and will also model how shocks are likely to change migration patterns and resultant patterns of resource use. Agent-based modelling will allow for an examination of complex, emergent patterns of behaviour resulting from a relatively simple set of individual behavioural rules that are parameterized from experimental results. The agent-based model provides a platform for representing basic theories of how individuals interact with each other and their environment. In addition, the model will also provide a tool that informs decision making by allowing users to experiment with how certain policy interventions will change the ways individuals respond to risk, thereby changing larger-scale patterns of migration and resource use. The project aims at improving the knowledge in the areas of sustainable development, natural resources exploitation, migration and climate change. As behavioural economic research on climate change is in its infancy, there is a very good potential for scientific breakthroughs. I expect that my results will show a strong relationship between perceived changes in environmental risk, experimentally measured individual preferences (risk, time and ambiguity) and social preferences. Subproject 1 and 2 will enable us to understand how natural catastrophes and livelihood security affect people's motivations to act and thus, key outcome variables related to natural resource use and human development. Stronger discounting of future benefits will lead to more uncooperative behaviour. Such changes in risk, time and social preferences will also require changing policies, regulations and economic modelling. One could expect that risk aversion leads to less innovation and impatience and stronger time discounting to stronger resource use. With subproject 3 we obtain more in-depth knowledge about information processing and learning which will be used as input for our Agent-based model. We will also learn about the drivers of migration. One potential result might be that incentivised controlled migration should be promoted, so that when shocks occur their effect will not be as bad. The outcome of subproject 4 will offer important and applicable knowledge about the interplay of migration and resource use which can be important tools for planners and decision makers in order for quantifying the expected number of migrants and reaction to potential policies and legislations. third-party funding for follow-up projects. The "shadow of the past" study will be carried out in the same 30 villages that were used in the initial study in 2012. We will try to track as many as possible of the original 810 subjects - if necessary also using phone interviews. The experiments were conducted in the Western Visayas (Region VI), in the province of Iloilo, Philippines. Existing databases suggest that the region is a slightly disadvantaged but not unrepresentative of many other regions of the Philippines. Philippine geography makes reaching and responding to the needs of remote areas very difficult. This implies that help to cope with the frequently occurring natural disasters (earthquake, typhoons) is mainly organised in within the respective community. In November 2013, one of the strongest tropical cyclones ever recorded (Yolanda), devastated portions of the Philippines, especially the Central and Western Visayas. On Iloilo many areas were severely hit, while others were not hit at all. In our data of 30 villages we have an even split between affected and unaffected villages. The "shadow of the future" project will be carried out in two regions of the Solomon Islands, which represent varying gradient sites of ongoing and future climate change impacts. First, we will work with people of the Reef Island. The atoll inhabit small coastal communities with an average population of 50–500 people per village. Second, we will work with migrants from the Reef island now living in Honiara, the capital city. Social preferences and solidarity: Intact communities are characterised by social norms of trust and cooperation as well as social networks that control individual resource extraction strategies. In the shadow of the past study, we will focus on solidarity experiments, which we already applied in the Philippines before. Solidarity generates and sustains strong feelings of togetherness and social-cohesion, resulting in collective action and mutual aid (e.g. informal risk-sharing arrangements). An adequate experimental tool to capture the relation between inherent risks of everyday life and mutual aid is the “solidarity game” introduced by Selten and Ockenfels (1998) . Participants play in groups of three, have the same endowments and face similar risks. We modelled risk by using lotteries that involved rolling a die. Every participant was provided an initial endowment of 200 Philippine Pesos (PhP) and depending on the die roll she was allowed to keep all or part of it. If the die showed a 1, 2 or 3, the endowment was kept. If the die showed a 4 or 5, the participant lost 100 Pesos of the endowment. If the die showed a 6, then 180 Pesos were lost. Within their group of three players people could then transfer any money to other players – possibly to compensate other players for losses. See Suppl. materials 1, 3 . In the shadow of the future project we will rely on the Social Value Orientation task and additional survey items related to place attachment, perception of climate change, etc. See Suppl. material 2 . Network Survey: A portion of the survey work will seek to understand the networks of cooperation and resource exchange that currently exist in each village. We will measure complete networks by generating lists of all households in the village, which we can then ask respondents to choose from in a series of “roster” network items. Survey respondents will also be asked about their understanding of the environmental risks they face, in particular changes in sea level and expected changes in resources such fish stocks. In a separate set of network questions, respondents will be asked about the social contacts they share information with about resources and potential future changes in these resources. With these data, we can model learning about environmental risks as a function of social network position, and how the trustworthiness of information changes as a result of the source of the information (social contacts who occupy certain network positions or certain formal organisations). These data will allow us to test whether or not variation in actual risk in these communities explains variation in perceived risk, and whether actual/perceived risk in turn explains variation in the way in which people structure their networks of cooperation, resource exchange, and information sharing. Finally, we will explore the link between the network and the decision to migrate by including hypothetical questions about the likelihood of migration under a variety of hypothetical scenarios. In addition, general information about the participants will be collected, including: Socio-demographics, wealth, perceptions of environmental and other risks, potential reasons for migration, social network, psychological personality traits, attitudes to insurance, valuation methods to obtain non-material benefits from ecosystems like spiritual inspiration and cultural identity. Timeline (according to tasks specified in the full version of the proposal). I follow the Ethical Principles for Research Involving Human Subjects including informed consent and debriefing. The proposal was wriiten with support from: Bernd Hayo (Philipps-Universität Marburg) and Adam Douglas Henry (University of Arizona). "Economic man" in cross-cultural perspective: behavioral experiments in 15 small-scale societies. Changes in observed behaviour in different contexts (political systems, market integration, resource scarcity, shocks, war, production technology, etc.) have been explained by changes in constraints (wealth, income distribution, available goods) rather than changes in preferences. For example, Cassar et al. find that four and a half years after the Asian Tsunami in 2004, preferences are significantly different for those subjects who lived in areas hit the hardest by the tsunami. Victims are substantially more trusting and more risk-averse, as well as more trustworthy than non-victims. This might reflect the fact that victims received a lot of support from other community members and outside agencies. It is also in line with the high solidarity transfers measured in the Philippines. Also the recently issued Fifth Assessment Report of the IPCC constitutes that global mean sea level will continue to rise by 52-98 cm by the year 2100, which would threaten the survival of coastal cities and entire island nations. Some initial evidence is pointing to the fact that the anticipation of resettlement causes psychological stress ( Hwang et al. 2007 ).